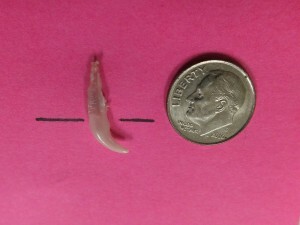 Just like in humans, a dog’s puppy teeth should fall out when their adult teeth erupt. 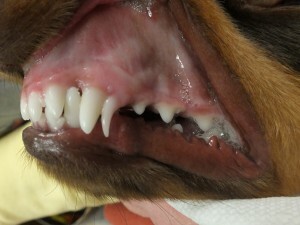 Sometimes, the puppy teeth do not fall out, and we refer to them as “retained deciduous teeth”. Retained baby teeth can occur in any breed. However, we see it most commonly in smaller breeds. It is important to remove these teeth as soon as it becomes evident that they are not going to fall out on their own (usually around 6 months). In this particular case of a 6 month old male dachshund, I removed the single retained baby tooth at the same time that I neutered the pup, so that the little guy only had to have one anesthesia. The reason it is so important to remove these teeth, is that they are usually right up against the adult tooth. The close space between the teeth is a great place for food and debris and hair to get stuck. Then the bacteria start growing. Before you know it, you have a severely diseased adult canine tooth. 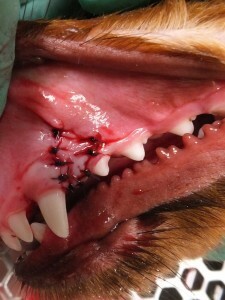 This is a source of pain and infection for the dog. Upper left arcade. The retained baby tooth is the slender tooth located directly behind the adult canine. 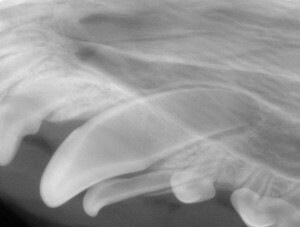 X-ray: Note how long and slender the root of the baby canine tooth is. Surgery site following extraction. The sutures will dissolve in 21 days. It is important that the tissue is surgically closed after extraction so that food and debris does not get packed into the area where the tooth was removed. 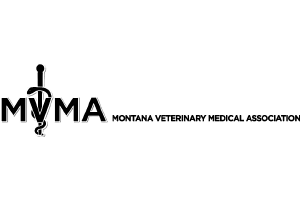 The area below the black line is the crown. The area above the black line was underneath the gingiva. It is very important that the tooth is removed in its entirety. Root tips that are broken off and left behind in the dog can cause significant medical problems in the future.